Typically the Bare Minerals Holiday 2015 Collection is massive! The brand really goes all out with a variety of different Holiday makeup sets and palettes plus they are launched across a variety of different places with exclusives popping up at Ulta, Sephora, Nordstrom, QVC, and many other retailers. I don’t have all the details on Bare Minerals Holiday 2015 as of yet but I do have some news to share on some of the regal/royal inspired Bare Minerals Holiday 2015 Collection that’s popping up on Nordstrom. Not sure if anyone got last year’s Bare Minerals Magic Act Eye and Cheek Palette but I loved it and it quite reminds me of this year’s Bare Minerals The Regal Wardrobe Set! I’ll definitely be getting the Regal Wardrobe as it’s bigger than the Magic Act a bit and it has a gorgeous array of colors! I also thought the brush set had a little bit of a Besame vibe going on don’t you agree? Love it! There’s plenty more upcoming from Bare Minerals for Holiday 2015 so stay tuned. These Bare Minerals Holiday 2015 Sets are available now at Nordstrom.com. Are BareMinerals holiday sets normally available at Ulta/Sephora as well, or just Nordstroms and the BareMinerals website? Ah, just re-read and realized you put it in the first graf. Sorry about that! I guess I was too busy looking at the beautiful makeup and just skimmed that first paragraph. 🙂 That Regal Wardrobe set looks EXCELLENT. Have you tried any of their limited edition palettes–are the quality of eyeshadows the same as in the 8.0 palettes? I’ve been itching to try some of the BareMinerals 8.0 palettes, but with the blushes, bronzer, and luminizer, this might jump to the top of my “to buy” list. Oh how exciting! I would actually use EVERYTHING in the Regal Wardrob palette! I have never seen a palette in which I would use it all so this might actually be worth it! I wonder if it is available at Ulta? Keeping fingers crossed for Ulta as I have points coming up. I contacted PR so trying to get updated info! I wish Bareminerals would make more Marvelous Moxie Lipstick sets. It seems like they always have a bunch of Lip glosssets, but few, if any, lipstick sets. Their lipgloss is nice, but I love the lipstick more! I hear you! I’d love a moxie lipstick set! 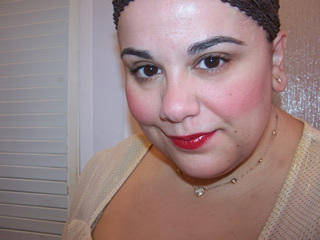 Check out qvc.com because today they had a lip set of pink toned Bare Minerals gloss & lipstick. It’s not a holiday set, but at least it has lip products. I bought some of their stuff last Holiday season, but none of this is calling my name. Wow – this all looks sensational. With all the holiday palettes coming out it must be hard to choose which one to buy. This is a really useful set – with everything all together. Love the colours. I had regal wardrobe on my list as soon as I saw it the other day. And I immediately thought of the magic act also. I bought that last year and I use it quite a lot. I think this one would be a winner also. Can’t wait to see what else is coming. I can safely skip the tiny treasures though. I think I have them all from sets or at least all but maybe one. haha you too eh? I immediately thought Magic Act! I love that set so I think I’ll adore the regal wardrobe set too! I also found the deluxe sized foundation on the QVC website – it’s beautiful packaging. For some reason I can’t find it in the search but the item number is A266519. It has that same red and gold regal packaging and comes with a little pocket mirror. thanks for the item number Liz! Nice to see them doing this again this year! WOW! that’s a nice set! Wow – this looks heavenly. Love the whole collection. Just gorgeous. These look pretty. Thanks for the heads up! Left a comment yesterday with a link for the Moxie lipstick set at Ulta. It hasn’t shown up. Not sure what I did wrong to get my comment deleted but was just trying to share. And yet I’m getting follow-up comments. Gotta love it. Lyn, I’m actually approving comments from the weekend right now and haven’t gotten to yours yet. I have over 250 comments to get through from the weekend and I’m working as fast as I can to answer and approve them. Sorry yours hasn’t yet been approved or replied to but it will be as soon as possible. Typically newer comments show up first in my dashboard so I’m seeing this but I’m not seeing one you posted over the weekend. Just give me a second, sorry for the delay! I understand. Was just weird that I saw other comments before mine. Will know moving forward, thank you. Great! 🙂 I still haven’t seen the one from the weekend but I’m replying as fast as possible so hope to get to it right away! P.S. You are going to want the lipstick set. The tube design is lovely, even if they are smaller in size. Hope you have a nice day and sorry for the misunderstanding. Aw no problem! This fingers are a typing away today 😀 I LOVE the set! Just saw it and need it for sure. No worries at all, no need for apologies! My friend next-door to me is a huge fan of this brand. She buys their Christmas/holiday items almost every year. In 2012 the eyeshadow set lasted her until now. LOL and she wears make up every day! I am considering going to Sephora or Macy’s or even the bare essentials store in the mall and seeing what I need as far as makeup goes. I usually wear no make up or very minimal makeup. But I am looking for some new stuff now that my skin is getting older and changing – I am 39 . What is your day today make up look? What are your brands as far as skincare and make up go? Could you please do a post where you discuss what you use on your face on a daily basis? That would be awesome! awesome! 🙂 They are great kits I don’t blame her! Glad you enjoyed the post Fran. I’m constantly switching up my makeup look so I don’t have any set look I use daily 🙂 as for my skincare, I did a post a long time ago about what I use and love but that’s changed considerably 😀 I’ll see about getting a new post live as soon as all the holiday madness dies down! I have two of the sets. The loose shadow set and the regal wardrobe. The loose shadow set is nice but not too practical for everyday. The regal wardrobe however is BEAUTIFUL! Pretty standard neutrals but very wearable. They give off a nice sheen on the eyelid. It’s also a pretty good value for 40 bucks. I would like to see your review of it. Sounds lovely Ivana! I don’t have it but if I get it I’ll be sure to post on it!